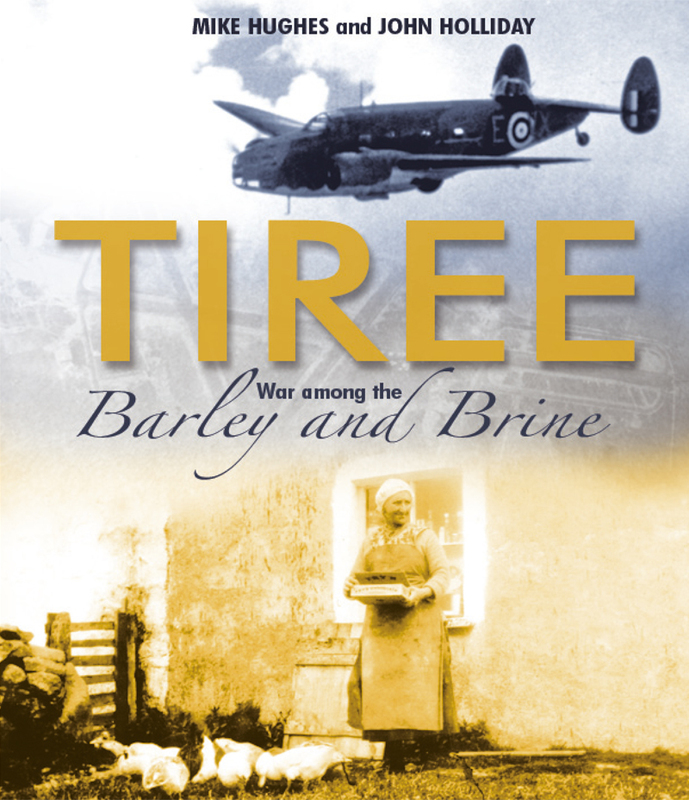 In the early 1940s, as country after country fell to Hitlerism, Tiree became a sentinel for the Clyde, other west coast sea ports, Atlantic supply convoys and even the weather in Europe. While the role that Tiree played in defending Britain and liberating Europe was of enormous importance, the influx of military personnel and infrastructure had a dramatic affect on the island’s residents and culture. In this definitive work, the authors have captured many memories of this momentous time. £15.00 - Available from An Iodhlann. 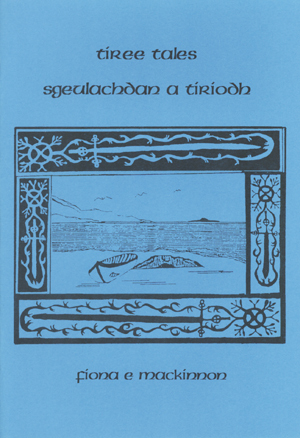 The island of Tiree is known for many things, but an increasingly forgotten part of its heritage is the island’s traditional poetry and song. 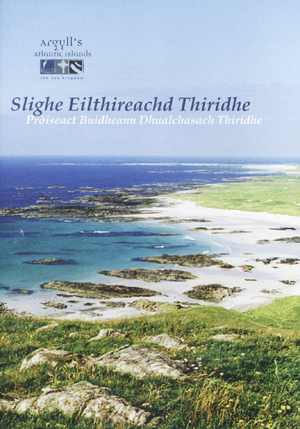 During the 2011 Fèis Thiriodh – the local Gaelic festival – islanders and visitors were asked to list their favourite songs written by Tiree people. This book is the result of that survey. 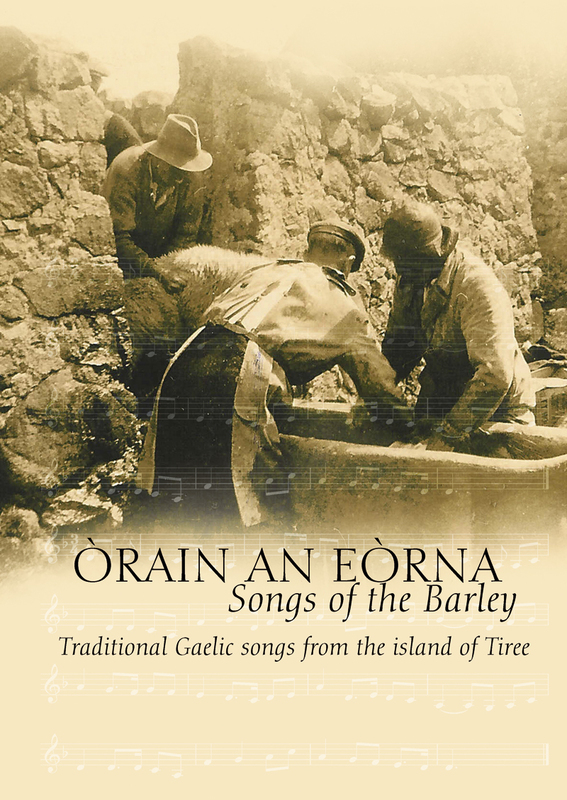 It contains, in order of popularity, the musical score to the top 20 Tiree songs, along with their lyrics in Gaelic and English. £12.00 - Available from An Iodhlann. 12 WALKS THROUGH AN ISLAND LANDSCAPE - The twelve walks in this book have been carefully chosen to give a taste of what’s special about this small Hebridean island. Some of the walks take in favourite beaches and destinations such as Balephuil, Balevullin and The Maze, The Ringing Stone and Happy Valley - others encourage the walker to explore less well-known parts of the island such as Caolas, Greenhill and Hough. Each walk takes you through a range of different habitats from coastal strand to machair and sliabh. All of the walks are accompanied by a clear map, a detailed description of the route and wildlife notes outlining what you may be able to see during the walk at different times of the year. 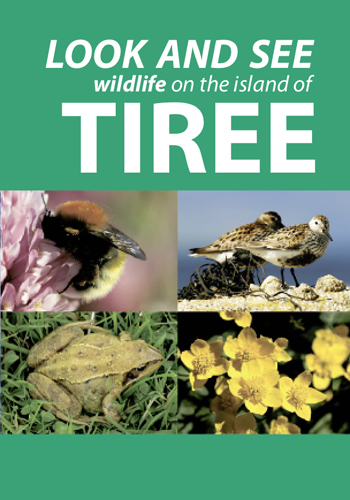 £8.00 - Available on the island from the Tiree Ranger and island shops. Tiree is a special place - its wildlife and crofting heritage are unique. Lots of of things on the island have either disappeared from, or have never occured on, the mainland. 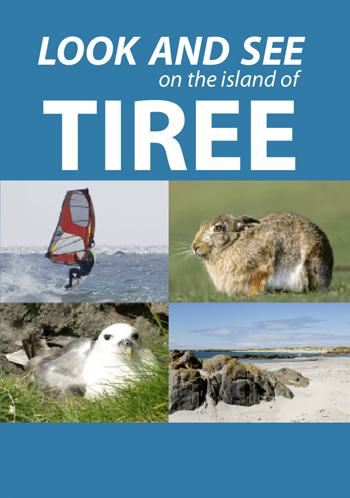 This book will help you to discover some of the things that make Tiree special. Bring your book along on walks, in the car and at the beach. £3.00 - Available on the island from the Tiree Ranger and island shops. An up-to-date and user-friendly account of the status of all 271 bird species recorded on the wildlife rich islands of Tiree and Coll in the Scottish Inner Hebrides. 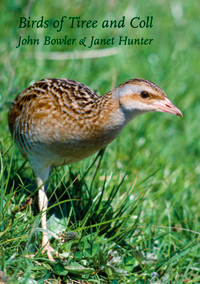 Tracing records from historical times to the present day, the book charts the changing fortunes of the wide range of breeding and wintering species that occur, as well as highlighting the increasing number of scarcer migrants recorded in recent years. Introductory sections include information on how the geography and land-use of the islands have shaped the habitats, as well as how birds have featured in local folklore. Also included are where and when to watch sections, plus details of other wildlife that can be seen. £9.00 - Available from most outlets on Tiree and Coll. 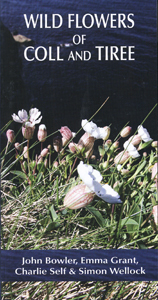 A unique and easy-to-use photographic guide to all of the most commonly seen wild flowers on the botanically rich islands of Tiree and Coll. Plant species accounts have been arranged according to flower colour for easy reference. Introductory sections include information on the different habitats of the islands and how geography and land-use have shaped the floral communities found there. 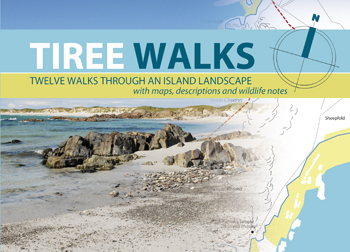 There are maps showing a suggested walk for each island, where the enthusiast can see examples of the main habitats and the plants they support. Also included is an illustrated glossary of flower parts and leaf shapes, and local plant-related stories. Julia Thurston, Library Assistant for Argyll & Bute and Distribution Coordinator, said of the book: "It is not often that you find a flower guide that you want to read from cover to cover and this copy will be well thumbed before it reaches the shelf. Congratulations!" 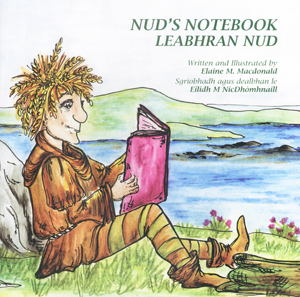 Nud's Notebook is a childrens story in English and Gaelic about the Eerit Clan who live in the Land Below the Waves. The clan are the guardians of the island's flora and fauna, its history and the environment. £5 - Available from An Iodhlann and most outlets on Tiree. 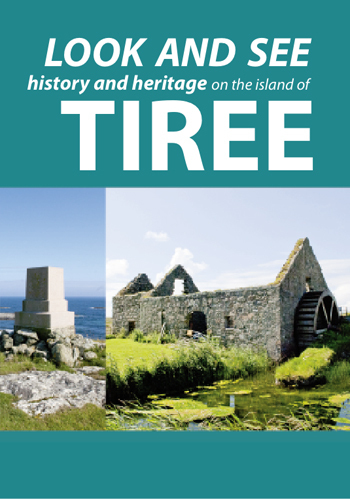 This book contains a blend of historical accounts and legends associated with the various townships of Tiree. Some of these townships are just a memory whilst others are thriving communities. £2.75 - Available from An Iodhlann and most outlets on Tiree. This book describes a walk linking many places which have Christian and pre-Christian significance. The walk can be completed in easy stages - and there are full descriptions of many important landmarks and much of the island's abundant bird and plant life. £5.00 each - Available from An Iodhlann and most outlets on Tiree. 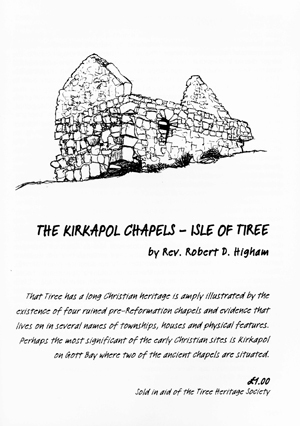 A booklet which describes the history, the construction and conservation of the two pre-reformation Kirkapol Chapels. £1.00 - Available from An Iodhlann and most outlets on Tiree.